When your belly are craving for some food but you can’t handle a big meal, then snacks is your only option. In modern times, there are many ways to make and eat snacks. People from around the world invented their own recipe of making snacks for them to eat between their meals. Just like any cultures around the world, Russia has a lot of different tasty snacks to offer. From the processed chips to the fresh homemade snacks, everything is available for you to try. 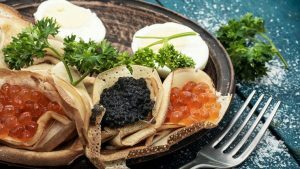 Once you’re in Russia, you wouldn’t want to miss the chance to try these tasty Russian snacks listed below. When bliny are too bland for you, then tvorozhnikis is a good-to-go. Basically, tvorozhniki or syrniki are similar to bliny, but it is a bit smaller and thicker. Tvorozhniki is made from creamy tvorog mixed with flour, sugar, and eggs. Just like blin, all you need to do to prepare a tvorozhniki is by mixing all the ingredients and fry it in a pan over low heat. Tvorozhniki is tastier than blin because the unique taste that came from tvorog. When Russian friends and families came around, it is common to see some tvorozhnikis served with sour cream and berries jam on top of the table. When you’re venturing around Tatarstan, make sure you have tried one of the best snack the Tatars has to offer, the Qazi. Qazi is basically a sausage made from horse meat stuffed inside horse intestines. It has a rich content of spices so spice lovers will surely get their hands on it. It can be eaten right away or cooked alongside other Tatars dishes. You don’t have to find any traditional Tatars yurt to have some qazi. Some restaurants in big cities like Kazan has listed qazis on their menu. Pelmeni is a Russian style dumpling originated from the Ural and Siberia region . Dumplings are well-known in the majority of culture around the world. What distinguishes pelmeni from the other dumplings is its consistency. Pelmeni is made from minced meat (any meat will do), covered in thin layer of dough. Onion, garlic, and peppers are added as seasoning. It can be boiled, steamed, or deep-fried, and served as snacks or appetizer. Pelmeni has thinner layer but more fillings than some other dumplings from Eastern Europe, such as Polish pierogi or Ukrainian vareniki. Because of its larger fillings, pelmeni is a good snack to eat between meals. Best served with mayonnaise and/or sour cream. When you’ve had some pelmeni but still not enough to stop your cravings, then some chebureks will do. In a nutshell, cheburek is a larger version of fried pelmeni. Originated from the Tatars that lived around Crimean and Caucasus region, cheburek is a popular food that can be consumed as a snack or a brunch meal. Pashtet is a foodcube made from a mixture of liver and meats. It has a high content of protein and iron, so most people will eat them along with other main dish. For some people, especially athletes and bodybuilders, pashtet is a good protein-rich snack for them to eat between work out times. Heading east from Tatarstan, you will arrive in the Republic of Baskhortostan, the land of horse nomads. Just like other steppe nomad tribes, the native Bashkirs are known for their meaty diet, with horse and lamb meat as their main specialties. Knowing about their diet, some vegans might be discouraged to visit this beautiful place. But no worries, there’s also plenty of Bashkir foods and snacks that are completely meat-free and safe for vegans. Aside from meats, the Bashkirs are known for their high-quality wild honeybee products. One of the most famed snacks from Baskhortostan is chak-chak. Chak-chak is considered as a snack and dessert, and it is made from dough and loads of honey syrup. The dough and the syrup are mixed inside a bowl, and then piled atop a large plate. After being exposed to the open air for some minutes, chak-chak will harden. Chak-chak has a high content of sugar, so it is best to serve it with a cup of tea, and no sugar added. “Bread is love, bread is life”. That is how the Russian respects their bread. As the main source of staple food, Russian have different ways to process and eat their bread. One of which is to be made as crisps. Some of these bread crisps are made of black bread. Russian black bread has a unique taste that you wouldn’t find on any bread around the globe. When it is cut in cube shape and deep fried, it tastes even better! You can eat it plain or add some garlic powder to it. A perfect light snack for watching films on the weekend. This is one unique snack that can only be found in Russia. It is has taken Russian people heart ever since it was manufactured. These chips are made from deep-fried potato and sprinkled with dill leaves and pickled cucumber seasonings. The pickles and the dills are some of the most Russian’s favorite. You can find a wide variety of dish that contains pickled cucumbers and dills. Many Russians are going banana when they knew their two favorite ingredients are used in a form of potato chips (as seasonings). Snack is a must have stuff when you’re about to gather around friends and relatives. It is a little bit hard to hang around when there’s nothing to chow down. And sometimes, bad things came out from an empty stomach. It gets worse when there are people around you. Trust me, you’ll thank me later. So, that’s some of the Russian snacks that are highly recommended for you to try. Some of which are available in stores, but sometimes you have to make it yourself. But anyway, don’t forget to share these good foods, because good food tastes better when it shared among friends.